Water could be drawn from standpipes outside the houses. It came from a reservoir and streams above the village and passed through a filter house on its way to the standpipes. Blocks of privies provided shared toilet facilities. Each household used a coal bunker in the row of bunkers at the end of their terrace. Some of the houses had a narrow strip of garden in front of them. A general store and newsagent opened in 1883, but for many shopping requirements trips to Burntisland were necessary. Postal deliveries began in 1884. A football pitch was created east of the High Binn, close to the main shale dump. The Binnend Rangers had a particularly successful year in 1891, winning 27 matches with a goal difference of 86 to 48. Other favourite sporting activities included tug of war, quoits, and gymnastics. With educational objectives in mind, a reading room and hall were provided in 1887, probably in the Low Binn. Newspapers and magazines could be read there, and special functions would be held there. Two years later a small church was opened. It had a steel bell weighing one and a half hundred weight, said to emit very pleasing chimes. A Sunday school had been held for several years. One year its annual outing took the form of a picnic in a field half a mile away. Musical entertainment was provided by a local flute band, and tea and games were enjoyed. 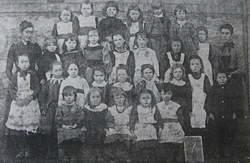 By 1889 there were 169 children of school age in Binnend. As we have seen, there were indications by then that the shale oil works might have a limited future, but plans for a school were approved, and its official opening took place in February 1891. The headmaster was James Smith, who moved from the Burgh Public School in Burntisland which many of the Binnend children had previously attended. It seems there were three other male teachers, and two women teachers in the infants department. Within a few years the population of Binnend had started to decline, and the school was closed in 1895. For entertainment and other leisure activities people from Binnend would have walked down the hill into Burntisland. The attractions of Burntisland included an annual fair, where you could buy brandy snaps, gingerbread or sugar hearts on the sweet stalls, try your luck in the boxing booth against Jimmie Lavin of Sterling, the “hero of a hundred fights”, ride down the helter skelter, or watch animal shows that included a tame lion. The Burntisland annual fair, as it would have been in 1910, has been vividly recreated in Burntisland Museum. Reports in the local newspapers indicate that people from Binnend were sometimes in trouble for alcohol related offences. They were charged with assault, and being drunk and disorderly. On one occasion ten miners from Binnend appeared in court for breach of the peace, and in 1884 it was reported that all visitors to the shows on the Spring Holiday had behaved in a satisfactory manner apart from a few miners from Binnend. A school photograph. 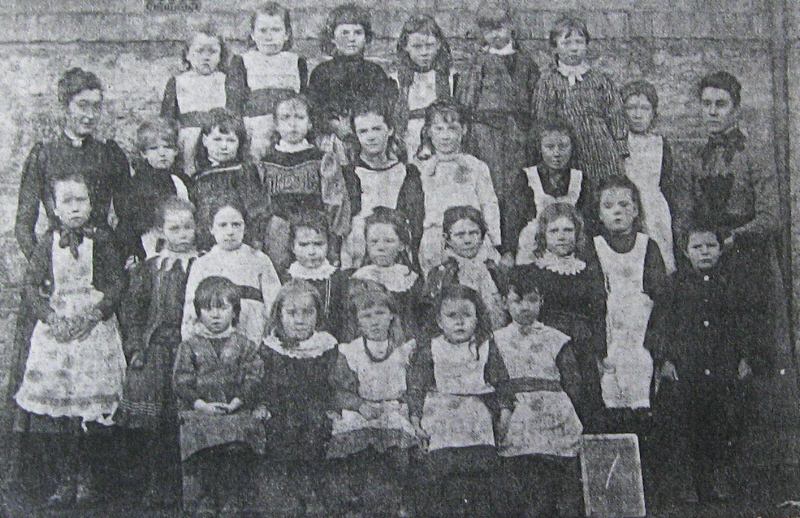 The fourth child from the left in the second row from the front is Miss McGauchey. The teachers are Miss Barbara Isles and Miss Maggie McLeod.